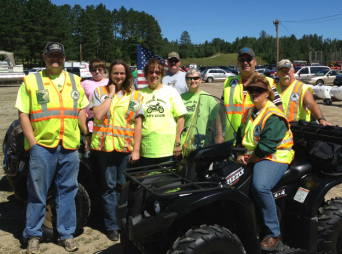 Along with trail monitoring, our Trail Ambassadors enjoy attending local events and visiting with other ATV riders about the riding trails in Itasca County. Sharing the trails is a big part of our mission. On March 22, 2014, Doug Lord and Connie Andrews completed their 8 hour training as ATV Trail Ambassadors. They are 2 of the 4 new Trail Ambassadors who join the 16 already certified in the Rapids Riders ATV Club. They are seen here with Officer Leland Owens, Recreational Training Coordinator and Shelly Patton, Recreational Training Officer. Congratulations and thanks for becoming a Trail Ambassador. If you are interested in joining the TAs, please contact David Andrews (dajr62@yahoo.com) for more information, or check out the MNDNR website at www.dnr.state.mn.us . On April 12, seven Trail Ambassadors from the Rapids Riders ATV Club attended the Volunteer Trail Ambassador Annual meeting wrap-up/review of the 2013 Trail Ambassador program held in Brainerd. DNR Enforcement Recreational Training Coordinator, Lt. Leland Owens and Captain Mike Hammer, DNR Enforcement Education Coordinator walked through the statewide statistics of this 6 year old program and updated us on the new law changes. Last year TAs spent 5,371 hours monitoring the trails and covered 15,499 miles of trails doing it! Trail Ambassadors don’t just ride around. They make personal contacts with other riders, give information, advice, directions, aid and comfort and just generally meet and greet. They also report issues on the trails – hazard trees, washouts, illegal off trail travel, missing/damaged signs, and invasive species. This information is distributed to the proper Trails office for their crews to resolve. Pictured here back row L-R Leigh Serfling, Allan Van Den Heuval, Dave Andrews, front row L-R Officer Leland Owens, James McKnight, Connie Andrews, Doug Lord, and Len Hardy.